The Wisconsin (BB-9) was the third and last of the Illinois-class battleships authorized by Congress in June 1896. Built by Union Iron Works of San Francisco, the Wisconsin was laid down in February 1897 and launched in November 1898. Commissioned on 4 February 1901, the ship when fully loaded had a displacement of 12,150 tons and was manned by 35 officers and 496 enlisted men. 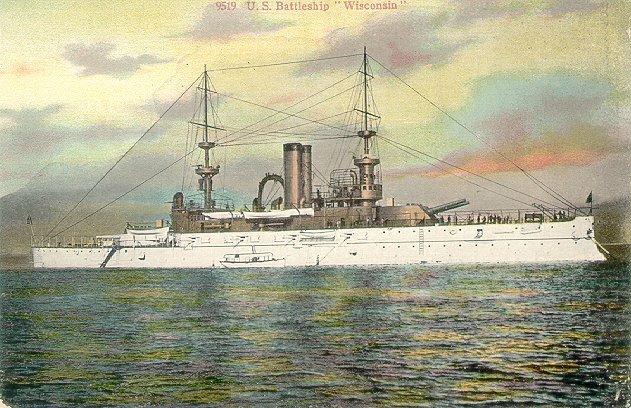 Assigned to the Pacific Fleet, the Wisconsin served as the flagship of the Pacific Squadron in 1902, and of the Asiatic Squadron from 1903 to 1906. Decommissioned in November 1906, the Wisconsin returned to service with the Great White Fleet in 1907, and was then assigned to the Atlantic Fleet in 1909. The Wisconsin was placed in reserve in April 1910. Assigned to the Naval Academy Practice Squadron in 1915, the Wisconsin served as an engineering school ship and a midshipmen's cruise ship in 1918-1919. The Wisconsin was decommissioned in May 1920 and sold for scrap in January 1922.